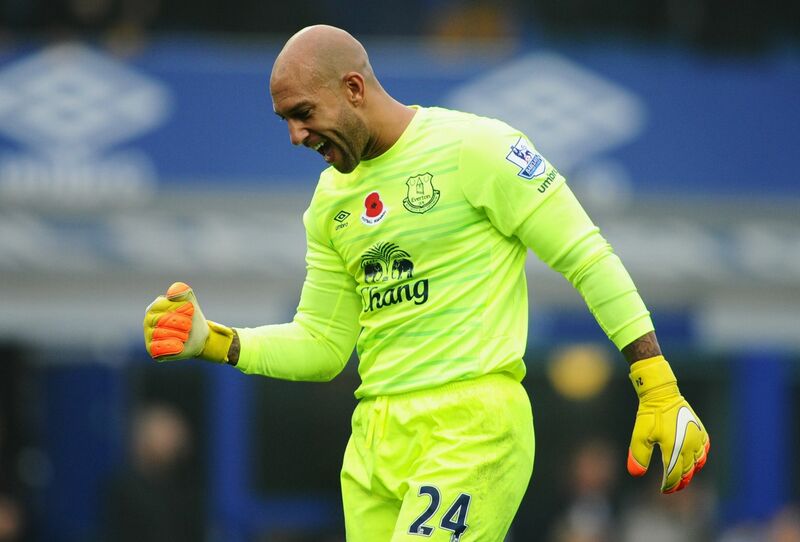 Despite the handsome victory Everton looked far from secure at the back, but on Sunday the blame should not be pointed in the direction of the under fire Tim Howard. Uncertain defending had already seen Sunderland hit the woodwork twice before they finally hit the back of the net with the final kick of the first half. Firstly Everton were caught dosing at the back, allowing van Aanholt to link up with Steven Fletcher before catching the post with a powerfully hit shot. Later in the half, with the game still at 0-0, Sunderland again hit the woodwork, this time Johnson striking the frame of the goal after a swift break, instigated by a misplaced ball across the pitch by Ross Barkley. When the Black Cats did score it was John Stones to blame. The former Barnsley man is an excellent defender, but he was caught dreaming of this halftime Lucozade by the quick thinking Jermaine Defoe. The former England striker whipped the ball of Stones’ toe, before hitting a shot that deflected off Everton’s number 5 and past Howard into an open net. Within minutes of the second half Sunderland pulled level. On first viewing the ball into the box could have been swallowed up by an advancing goalkeeper, but having watched the goal back on the TV, Howard would have been caught in no man’s land, with an excellent cross just out of the reach of any goalkeeper and perfectly weighted for Steven Fletcher to power a header into the Park End goal. If you re-wind to the start of the season you would have struggled to find a single Evertonian who would have dared suggest that Kone had a future at the football club. His name being sung loudly from the roof tops at Goodison Park was unimaginable; however on Sunday the Ivorian was the toast of the blue half of Merseyside, having struck a hat-trick to score his third, fourth and fifth goals of the season. I was certainly a non-believer in August, but in recent weeks have suggested that he was deserving of a starting role and against Sunderland he justified his manager’s faith, not only scoring three, but playing a leading role in much of Everton’s attacking play. His vision for the opener changed the course of the afternoon, a delightful ball behind the Sunderland defence letting Deulofeu in to open the scoring. His link up play with Romelu Lukaku and the aforementioned Spaniard left the Sunderland defence unsettled and the fact that Everton only scored six, owed more to the Blues letting their foot of the gas, rather than Sam Allardyce engineering a plan to holt the onslaught. The clamour to ensure Gerard Deulofeu is a fixture in the Everton starting line-up has grown in recent weeks, but with the exception of the West Brom game, his exhilarating play has failed to produce an end product. That all changed on Sunday, with a goal and two assists on an afternoon where he firmly established himself as Everton’s number one wide man. There is certainly plenty of competition for what appears to be a single winger in the Blues starting XI. Kevin Mirallas, Arron Lennon and Aiden McGeady would all relish the opportunity to start, but with Martinez preferring to play Kone or Naismith on one flank, those chances look limited. Certainly for the next two of three fixtures it is hard to see how the former Barcelona man could be left out of the Everton team. It has been a stop-start season for the Irish full back, but Seamus Coleman hinted at a return to form on Sunday with a lung busting performance from right back, which was all the more incredible considering that he was a significant doubt for the fixture after suffering from a bout of illness during the week. Everton have missed his attacking threat this season and if the Blues are to push on in the next 8 or 9 matches they will need Seamus Coleman to be at his brilliant best. There are many calling for Martinez to start with two out and out wingers, but the inclusion of Arouna Kone as a ‘wide forward’ is getting the most out of Lukaku without committing the Blues to two out and out strikers. The link up play between Kone and Lukaku was particularly impressive on Sunday and the two have an excellent on pitch relationship. The link up play between the two led directly to two of Everton’s six goals and they also linked up to assist each other earlier in the season against Watford, Southampton and West Brom. In matches where Kone and Lukaku have started for Everton this season the Blues have collected 11 points from a possible 18. In those 6 games Lukaku has scored 5 of his 6 Premier League goals this season. 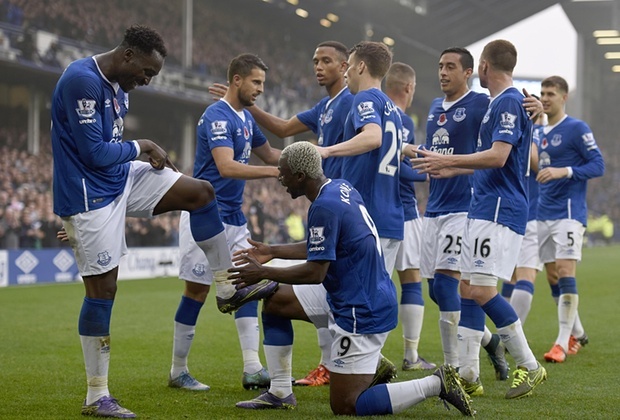 In fixtures where Kone has been left on the bench the Blues return has dipped to 5 points from 15. It should also be noted that of those 5 points, Kone came on as a substitute with Everton trailing to both Watford and West Brom, with his introduction leading to the Blues collected 4 points from losing situations.